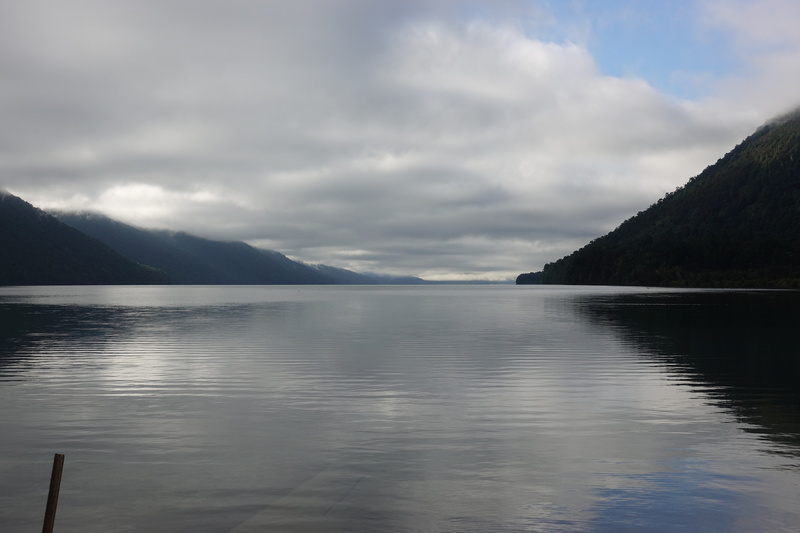 After we fled Lake Rotoroa and the ferocious sandflies (we’re still scratching our ankles and other exposed body parts) and stocked ourselves with DEET in Murchison the next day, Cédric and I biked onward in the direction of the West Coast. 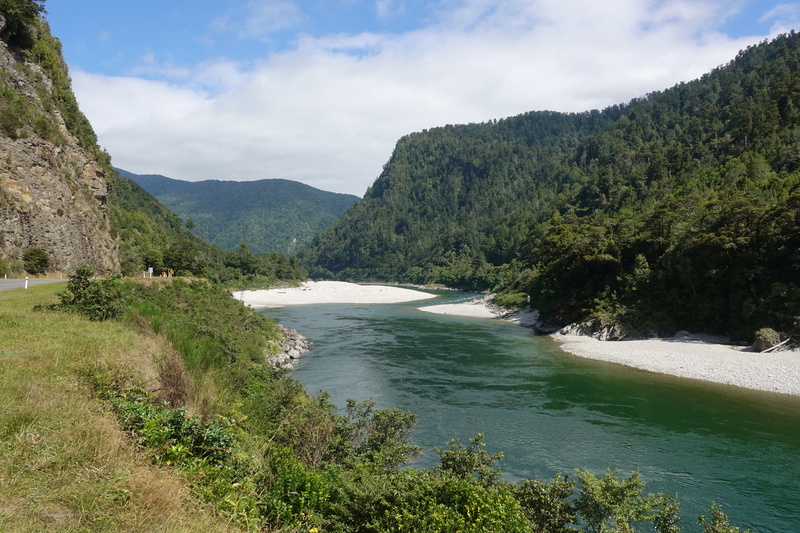 Although we were riding towards the ocean and technically downhill, the Highway 6 was undulating as we rode along the Bullet River. Ever since the start of this trip, Cédric and I have been praying for an “easy ride day,” where we can rest our legs and coast downhill… but the rest of that day wasn’t one of them. 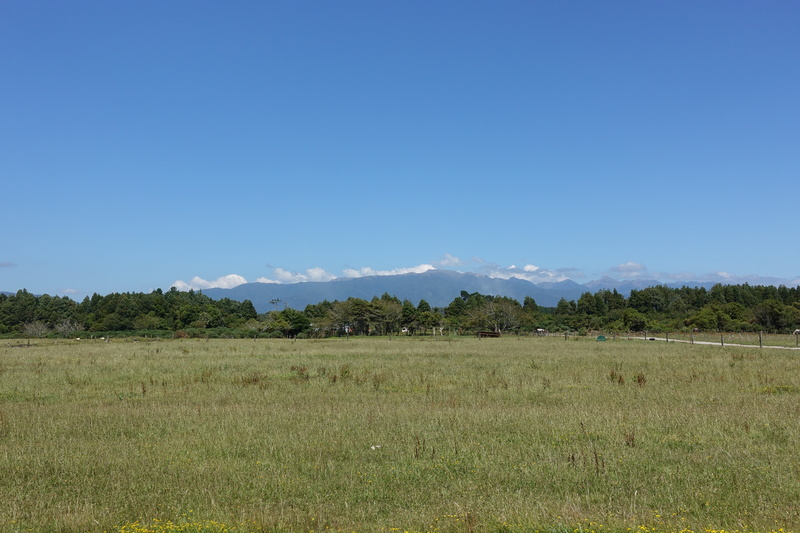 We continued 50 kms to the nearest town to Murchison, Inangahua, where we hoped to get a Coke (aka. magic potion: sugar and caffeine) and rest for the night. However, Monday was “Buller Anniversary,” a local holiday celebrating when the area was founded (or something like that) and the only shop in the town of 20 houses was closed. Without anyone to talk to, let alone cellphone/data coverage, we were wondering what the plan for the night was going to be. 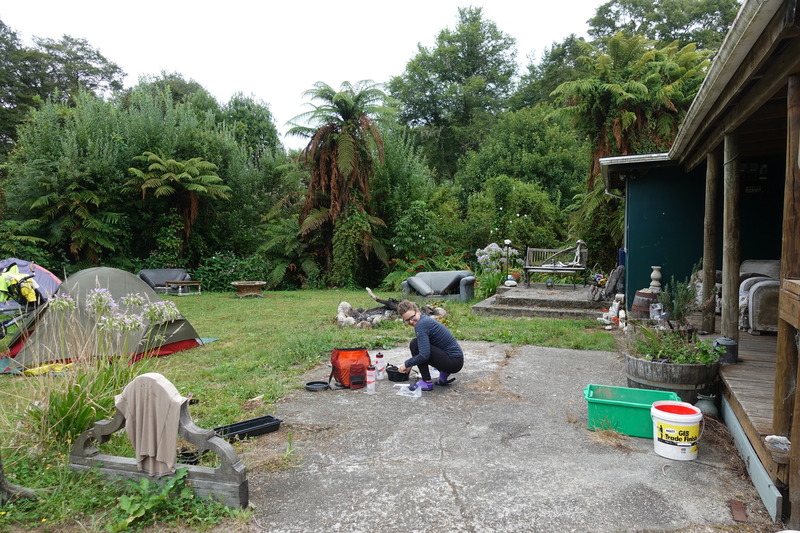 Slightly stranded, Cédric walked down the road and asked the first human he saw if we could camp on their lawn for the night. 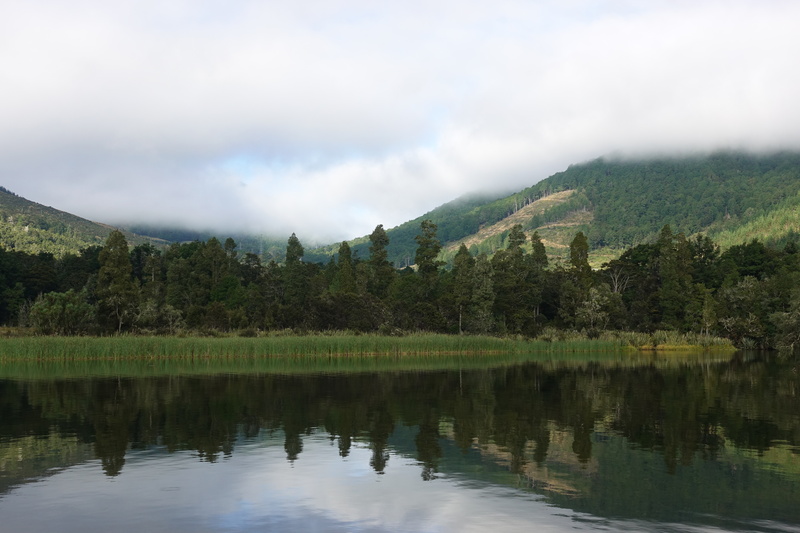 It turned out to be the property of Richard and Andy, two guys who were in the middle of building Inangahua’s next big thing: Bonnie & Clyde’s Gold Panning and Mini Golf experience. Fortunately, they let us camp out in the back yard and even take a shower. 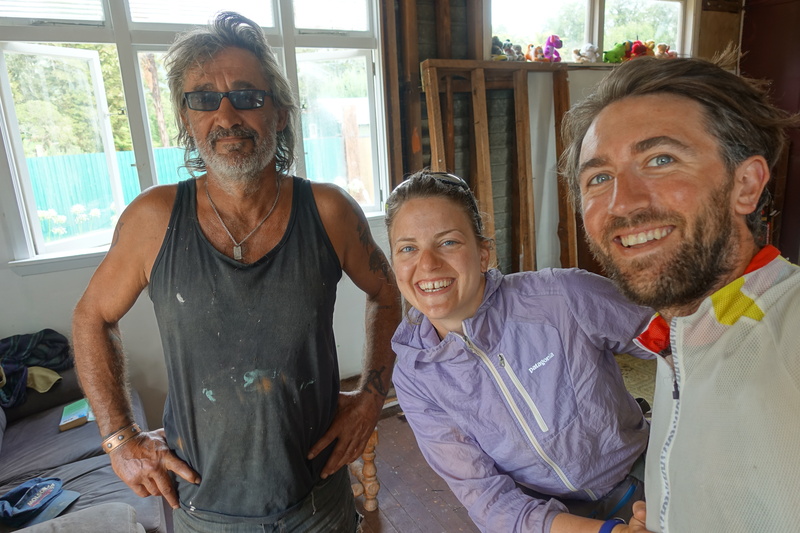 After relaying our harrowing sandfly experience from the night before, they showed us a few local tricks to keep the buggers at bay , like rubbing some type of plant resin on your skin. Their other technique is to burn a pile of fern plants and make as much smoke as possible – humans probably survive longer in that atmosphere… Unfortunately, our fresh blood is too delicious for the sand flies (and mosquitoes) and we still felt like live bait, so the only reliable solution was to jump into our tent behind the mosquito net at dusk. The next morning, Richard told us a bit more of the area’s gold mining history (you can still find gold in the river) and their business concept. 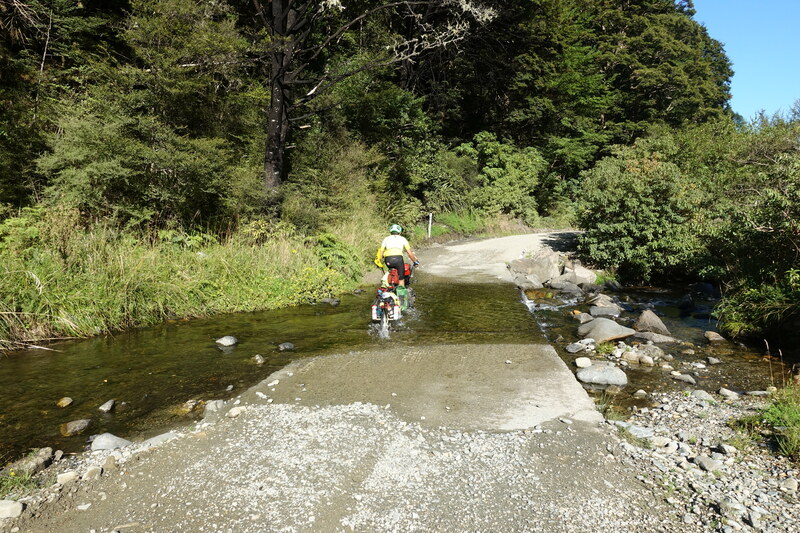 After we parted, Cédric and I continued following the Highway 6 “down” the Buller River and made more than a few stops for pictures along the way. 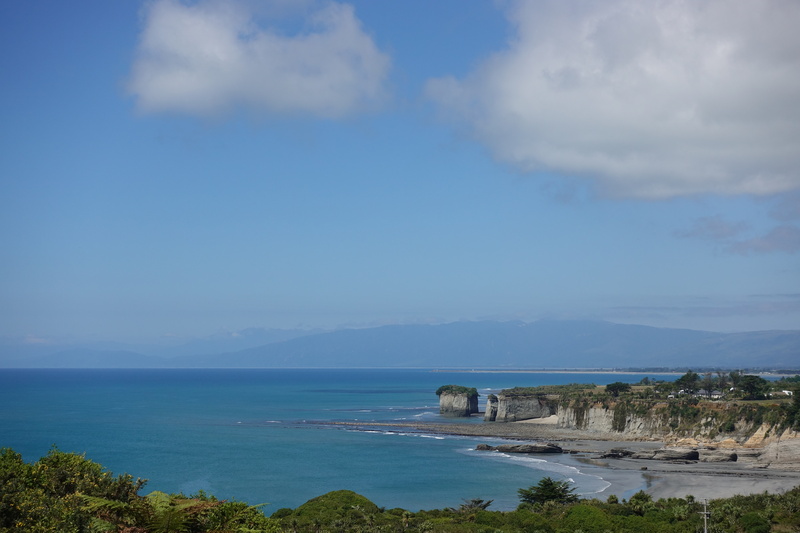 Although this was the tourist season and the roads were said to be heavily trafficked, we found the ride a pleasant departure from the busier highways in the North Island (also possibly thanks to some muffins sold of the side of the road…). Lunch was spent in Westport, where we restocked our pantry and ate our lunch in the shade of the town square. 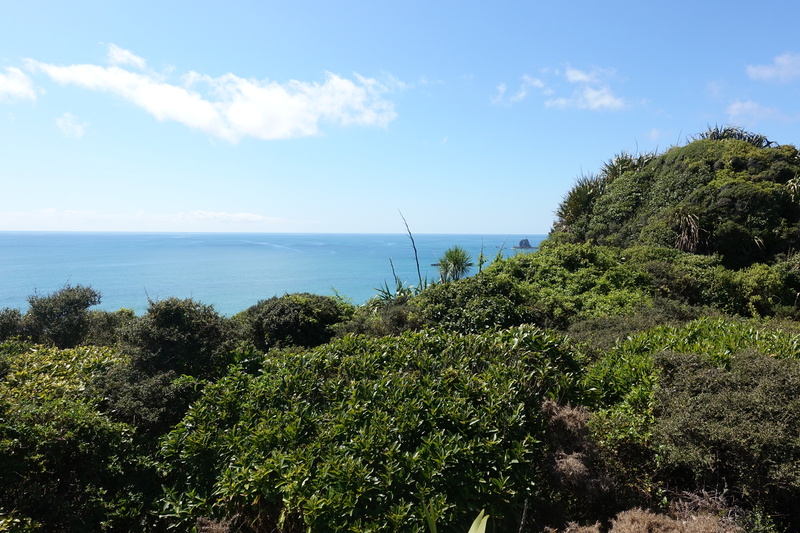 As we continued cycling, we took a detour along the coast to Cape Foulwind (named by Captain Cook in … you guessed it, foul wind) and Tauranga Bay to look at three seals. Our plan for that evening was to ride and ask a farmer if we could camp on their property for the night, but as luck would have it, it hilly landscape wasn’t inviting for farm houses (and electric fences prevented us from simply going into a field). 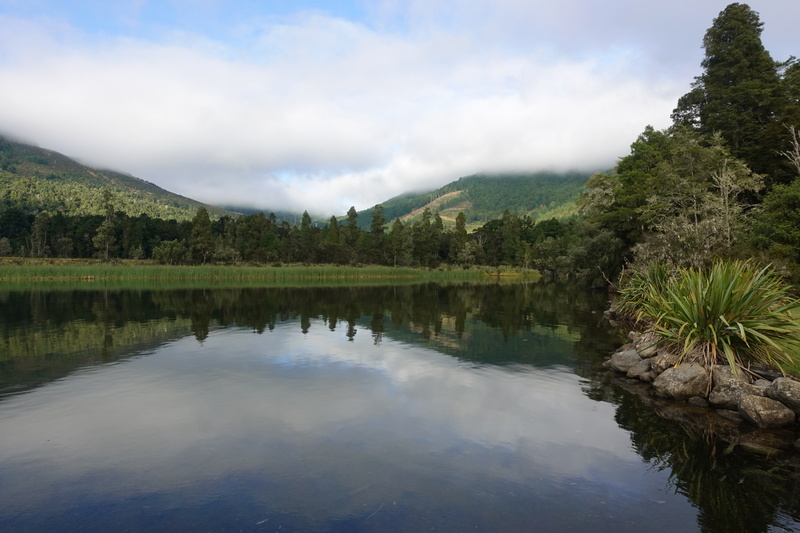 After a few more kms than desired, Cédric and I turned off the road and camped next to the Totara River, where more sandflies were awaiting our blood. I attempted to used Richard’s lavender-smoke-around-the-tent trick, but we were still besieged at nightfall. Nothing close to the Rotoroa nightmare though! 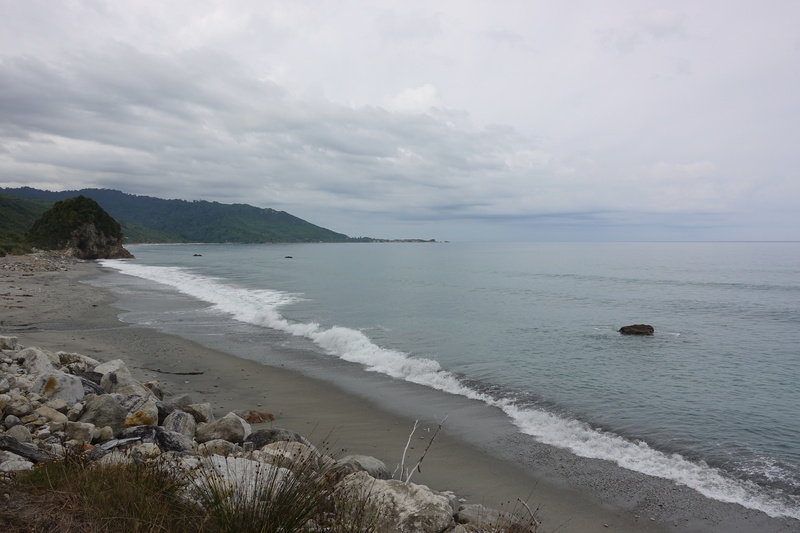 Wednesday, yesterday, we woke up and found ourselves with the pressing need to pack up and get to Greymouth before nightfall – as a large storm was headed for the West Coast on Thursday. 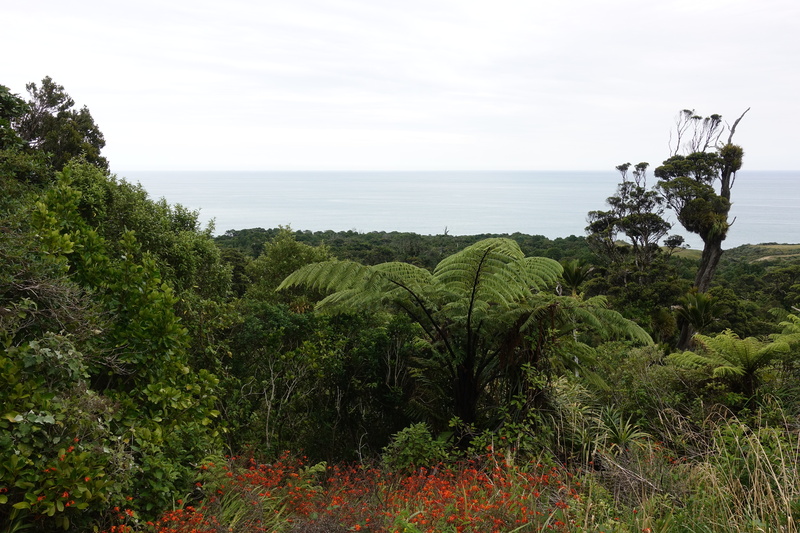 As Cédric checked the altitude profile of that day’s ride, he murmured a “shiii…” What we thought was an easy 80 km along to coast was actually a very hilly 80 km with a continuous succession of ups and downs – we’re slowly coming around to the fact that no road is anywhere near flat in New Zealand. 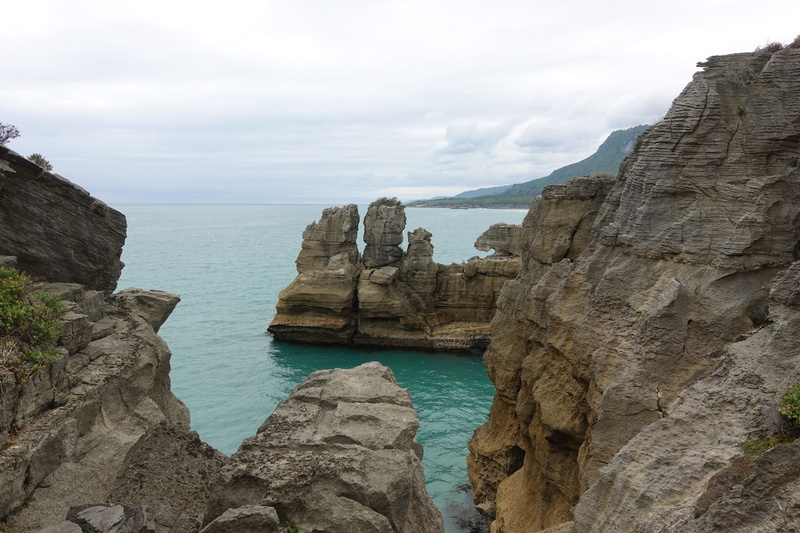 The first half of the day to the Punakaiki Pankcake Rocks was a struggle with our perma-sore legs and two very large climbs. The first 5km having taken us 45min, a short mental calculation was a bit worrying about our estimated time of arrival in Greymouth. 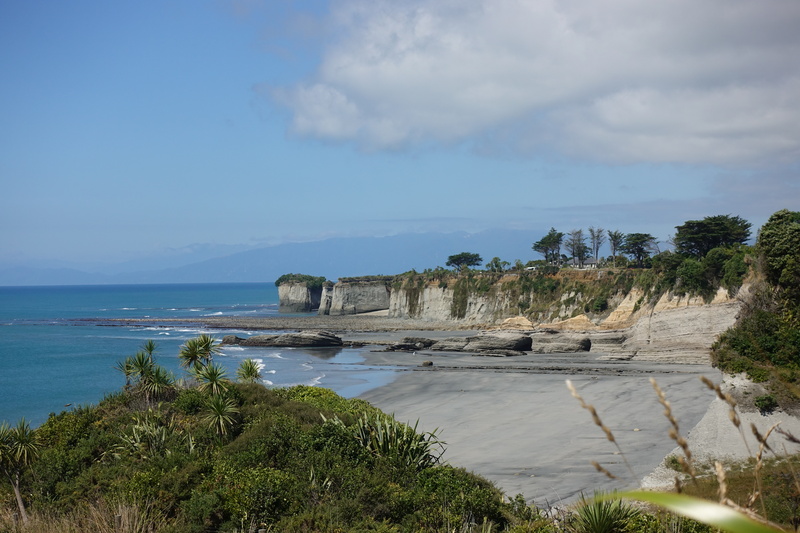 After our stop at the Pancake Rocks, we continued on for a bit before a lunch of bread and peanut butter. 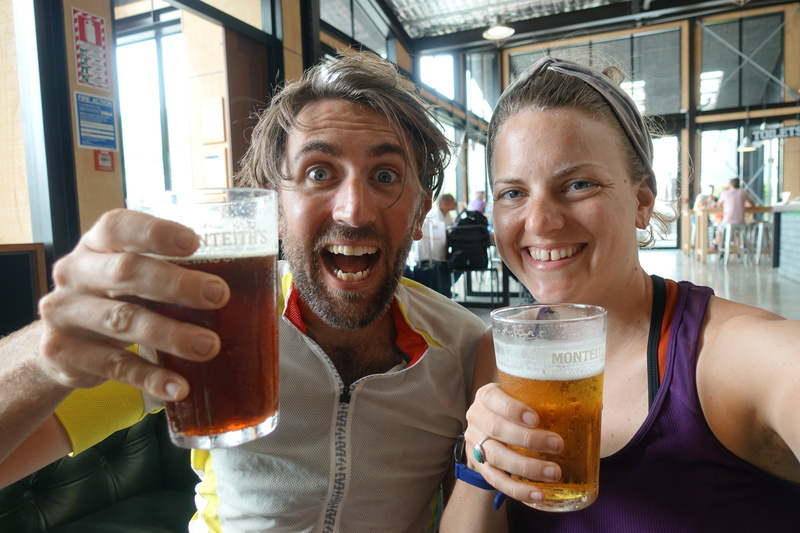 In the late afternoon, tailwind helping, Cédric and I rolled in to Greymouth and happily spotted the Monteith’s Brewery… so of course we congratulated ourselves with a pint of pale ale before we ended at our hostel. We realized after the pint that this wasn’t necessarily the greatest idea… beer goes quickly through the body after a day cycling and not much food previously! Luckily our place to sleep was straight down the road. 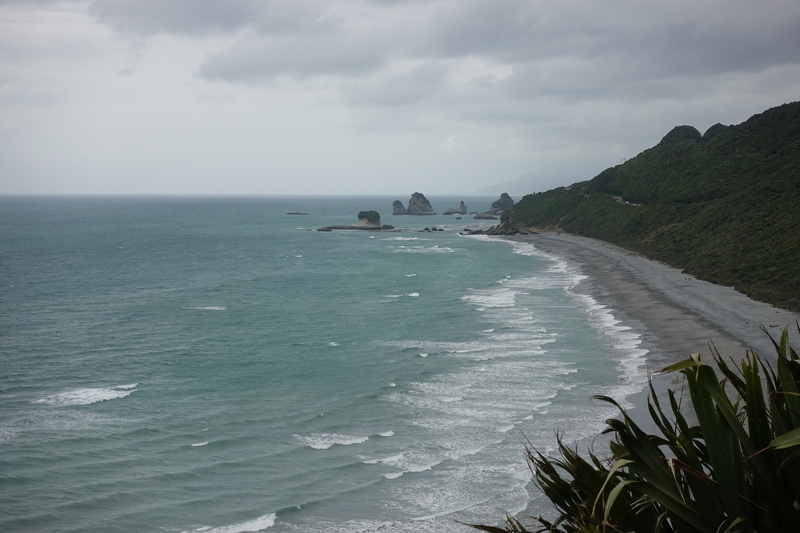 Today, we’re taking a rest day due to a cyclone/gale force winds/northeasterlies, whatever you want to call it… it’s windy and not at all a good day to cycle (unless we want to end up flying into the ocean). For me, I’m happy to be under a roof because these winds are reminding me of the great Spanish helicopter scare during our hiking trip in the Pyrenees, where our tent was rendered unusable due to a strong gust from a helicopter rotor (small reminder of the geniuses from the Guardia Civil who had the fantastic idea to land almost on top of us two years ago). Tomorrow, once it stops raining, we’ll try to ride the West Coast Wilderness Train along the ocean and hopefully find some glowworms! We were glad to hear from you on the phone. More sunscreen for you, K-Sandra! I’ve been using so much! At least a reapplication of SPF 50 every two hours… thelack of ozone is to blame.